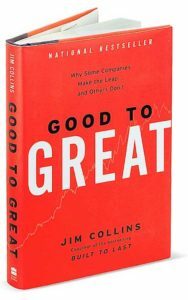 Twenty One years ago, Jim Collins asked the question, “Can a good company become a great company and if so, how?” In Good to Great Collins, the author of Built to Last, concludes that it is possible, but finds there are no silver bullets. Collins and his team of researchers began their quest by sorting through a list of 1,435 companies, looking for those that made substantial improvements in their performance over time. They finally settled on 11–including Fannie Mae, Gillette, Walgreens, and Wells Fargo–and discovered common traits that challenged many of the conventional notions of corporate success. Making the transition from good to great doesn’t require a high-profile CEO, the latest technology, innovative change management, or even a fine-tuned business strategy. At the heart of those rare and truly great companies was a corporate culture that rigorously found and promoted disciplined people to think and act in a disciplined manner. Peppered with dozens of stories and examples from the great and not so great, the book offers a well-reasoned road map to excellence that any organization would do well to consider. Like Built to Last, Good to Great is one of those books that managers and CEOs will be reading and rereading for years to come. Great overview and practical advice for leading a team or organization. The challenge for most will be to actually translate it into their daily activities and execute on it. I am excited to apply this road map to what I do as a manager of a small team within a very large company. I think I can be a level 5 leader even at this phase of my career and work toward getting ALL the right people. I am ready to get started! A wonderful anthology on the right and necessary steps a growing concern must continue to take if they are to remain viable in today’s society and ready for the future..
As a CEO, you must be above the fray of everyday operations and keep a keen eye on the future and potential innovations. For example, when Sears gave up the catalog in the early 1990’s, the potential of the internet was just beginning to raise its capacity to greatly influence a new way of doing business. If the Sears executives had not been so busy trying to save a buck and give up the catalog, maybe it could have retained its millions of dedicated shoppers and innovated along the lines of the internet that we know today as Amazon. Bezos, of Amazon, was a hedge fund manager in the late 1980’s. How did he become such a relevant retailer with a revolutionary way of delivery in the late 90’s. This is the clear message that I got from Good To Great. You must be willing to boldly assault the future and at the same time question if this is the right way to go. That way your organizations will not become complacent and our managerial core will be a group of activists and futurists. That’s how you keep going from Great To Even Greater. Good To Great is fine. But now you must take the next step.